If you live under a rock then you missed out on what has caused national outrage and shame. A video of a white man physically and verbally threatening black women and children at the Texamo Spur ranch at The Glen shopping centre is what you need to see today. The man approached the mother, Lebohang Mabuya with his claim that he saw a child hitting his child on the head. The altercation escalated to a full war of vulgar profanity as the man began to make a motion to slap the mother. Spur Steak Ranches on Tuesday banned a white male customer from all its chain restaurants after he was involved in an altercation with a Black female patron at the Texamo Spur at Glen Shopping Mall in Johannesburg. The heated exchange which included profanities, occurred in front of small children at Texamo Spur at The Glen Shopping Mall, south of Johannesburg, on Sunday. The incident was captured on video and has since gone viral on social media. In a statement on Tuesday, Spur said it was “very disappointed” that children were exposed to “this type of behaviour” and assured the public and its customers that it would not be taking the incident lightly. 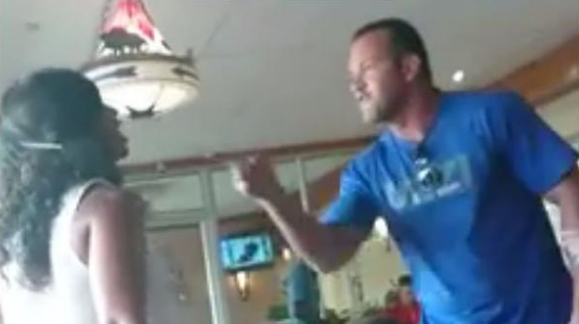 “The man in the video is not welcome at any Spur restaurant nationally. We do not condone any forms of violence against women or children, irrespective of the circumstances,” Spur said. It has emerged on Twitter that the man resides in Krugersdorp and this has not been the first time he has been violent.